My first thought when I saw Starlink: Battle for Atlas being presented during the Ubisoft E3 2018 Press Conference was simple: “Oh no…not another toys-to-life franchise. Hasn’t that genre already been killed and buried?” When I finally got my hands on the Xbox One version during the literal last hour of E3 2018, however, I was completely surprised and impressed with what I found. 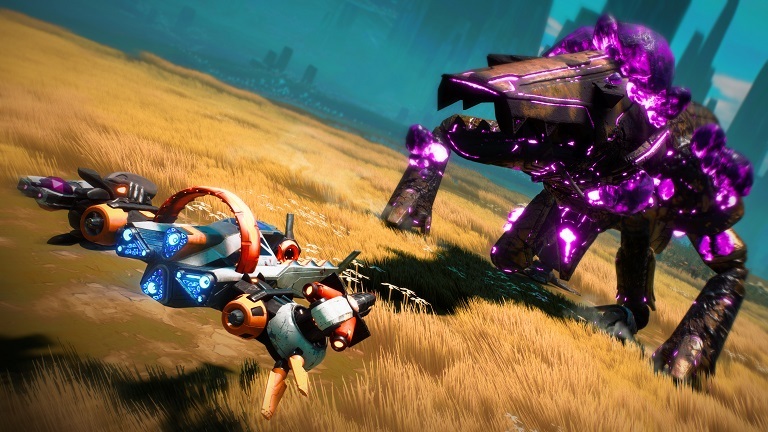 Starlink: Battle for Atlas‘ basic concept is deceptively simple. You pick your pilot (who each comes with their own unique in-game ability), and slide that piece directly into a mounting port that wraps securely around your controller. You then pick your ship (each ship has different characteristics to it), and literaly attach that over your pilot. Each ship constitutes a single life. At that point, you are free to attach as many (or as few) wings as you want onto the ship. The wings can even be stacked onto other wings. This multiple wing stacking gives additional bonuses to the ship, but makes it much harder to fly in turn. Finally, up to two total weapons can be attached to the wings. These weapons can be placed either facing out of the front of the ship or facing out from the back of the ship (and the weapon will be facing that way in the game as well). You then wind up with a huge, mildly inconvenient ship stuck on the front of your controller to play with that is replicated perfectly inside of Starlink: Battle for Atlas to play with – at least, until you decide to hotswap out parts (during which the game pauses) or your ship blows up and you’re forced to attach a new ship body in order to continue playing. 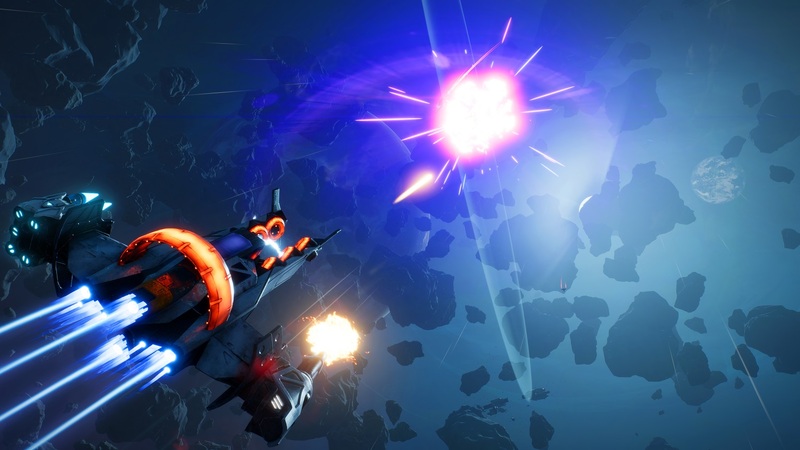 Part of the gameplay in Starlink: Battle for Atlas takes place in outer space. (Image courtesy of Ubisoft). In my Starlink: Battle for Atlas demo, I had four pilots, three ships, six total wings, and five weapons (flamethrower, machine gun, missle launcher, rocket launcher, and a ‘vortex launcher’) to combine and play with as I choose. I immediately started to stack pieces on top of each other, and I was surprised and quite pleased at how well the pieces snap together and then stay in place even while I was in the game. The Neptune (Images courtesy of Ubisoft). When I had finally put together my Nadir Rocket Class ship, with two stacked wings and a machine gun on one side with a single wing and a ‘vortex launcher’ on the other, I finally began the game and I was instantly dropped into deep space. In what evoked flashback memories of No Man’s Sky, I quickly ignited my ship’s engines and smoothly transitioned down to a nearby planet’s surface with no hiccups or loading screens. Once there, I was given objectives to complete and enemies to kill as I would buzz the surface, attack, and then use my engines to swoop back into the sky and far away when I felt like I was danger. 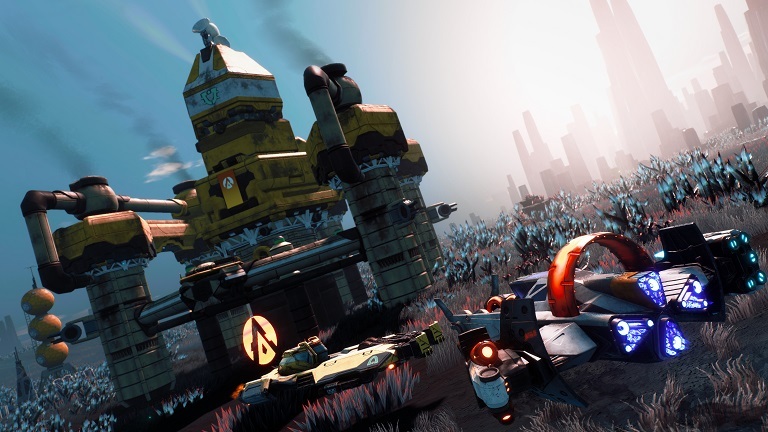 There is a lot to see and fight in Starlink: Fight for Atlas. (Images courtesy of Ubisoft). 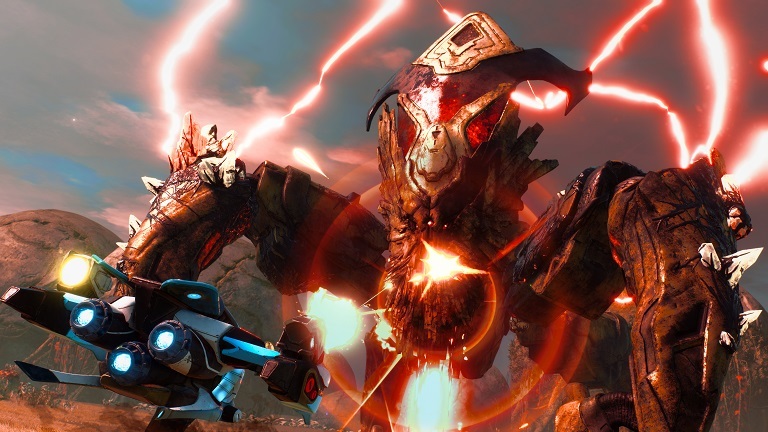 Skylink: Battle for Atlas’ battle gameplay presents itself as a bit of a gameplay puzzle, as different enemies have different attack patterns and different weapon weaknesses. 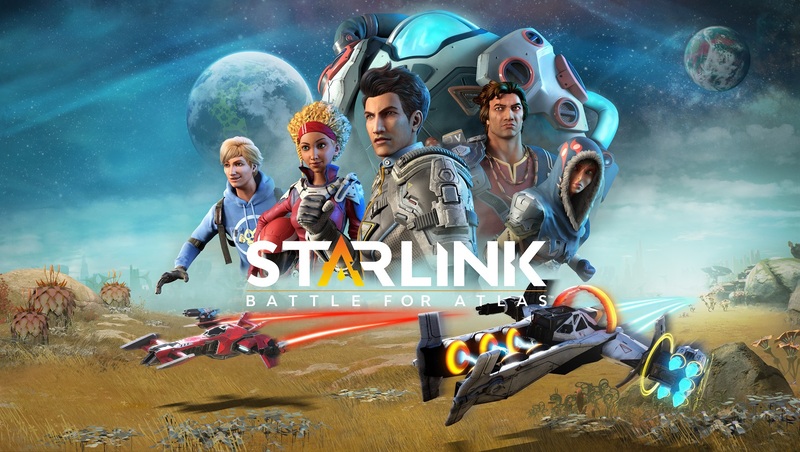 As a result, Starlink: Battle for Atlas really does encourage players to swap out pieces as you go along and to use different tactics for fighting enemies. For example, I would pull together groups of ice enemies with the ‘vortex launcher’ and then I would target their weakness using the flamethrower. During the big ‘boss’ fight towards the end of the demo, I would strafe its weakpoint with a machine gun as it lifted one of its arms and then attack the now-exposed core with missiles. The pilot abilities were pretty darn nice too, though I quickly found myself partial to the invisibility option (called “Vanish”) that Shaid provided me with a quick Left Bumper tap. The combat was fairly responsive to my controls as I played and fought in a 3D environment to kill off my enemies. Earlier, I drew a comparison to No Man’s Sky in how the ship seamlessly drops down from outer space to the planet’s surface, but that is where the similarity thankfully ends as Starlink: Battle for Atlas far exceeds anything that No Man’s Sky can do in terms of gameplay and the surrounding environment. The landscape has a LOT going on at all times with objectives to complete and enemies to kill everywhere. As a result, it did not feel like an empty, albeit beautiful, museum but instead really felt like a dynamic, living world that I was invading, and that would continue to exist without me. The potential customization of each ship is insanely deep. (Image courtesy of Ubisoft). Overall, Starlink: Battle for Atlas is a game that is deeper than you would expect for something in the toys-to-life genre, and integrates each individual piece in such a way that it honestly both doesn’t feel gimmicky and provides a lot of depth with how deeply you can customize your ship. That all being said, I am extremely curious to know how Ubisoft intends to package and sell the additional ship pieces, and at what price point for Starlink: Battle for Atlas. The answer to this question can potentially make the difference between Starlink: Battle for Atlas being a cool and relevant hit title and something that would be remembered as a bold experiment and nothing more. You can pre-order the Starlink: Battle for Atlas Starter Editions now for PlayStation 4, Xbox One, and Nintendo Switch (which comes with an exclusive Starfox/Arwing ship set). Are you excited for Starlink: Battle for Atlas? How would you design a space ship to take into battle?